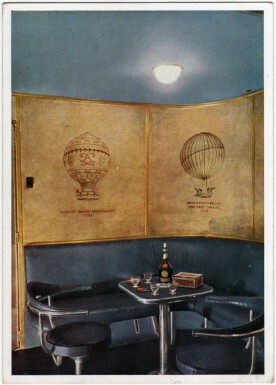 Yes, there really was a smoking room on the Hindenburg… even though the zeppelin was inflated with 7 million cubic feet of highly flammable hydrogen gas. 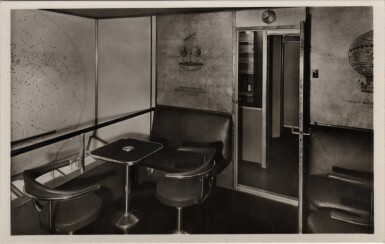 Pressurized Smoking Room aboard the Hindenburg, showing the airlock doors. The smoking room was kept at a higher pressure than the rest of the ship so that no leaking hydrogen could enter the room, and the smoking room was separated from the rest of the passenger section by a double-door airlock. 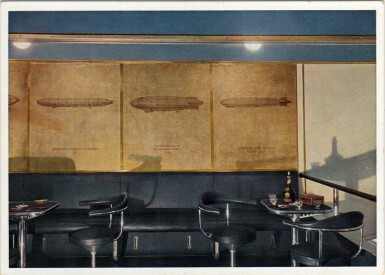 The smoking room was closely monitored at all times by a member of the zeppelin’s staff, and only one electric lighter was provided; no matches, lighters, or other open flames were allowed anywhere on the airship. The real danger of allowing smoking on a hydrogen airship — and the reason it was strictly confined to the closely monitored smoking room — was the risk of a fire; had even the smallest fire started in the passenger section, it could easily have spread to the gas cells above, destroying the ship. The smoking room was perhaps the most popular room on the ship, which is not surprising at a time when so many people smoked, but its popularity was no doubt enhanced because it was also the location of the Hindenburg’s bar. Tell us more about the details of this room, like the colors, the history of lighter-than-air travel on the walls and the star map above the windows. If no open flames were allowed, how could the cooks prepare anything? Electrical stoves didn’t exist in 1936 or I was assuming something to that effect. The stoves and ovens were electric.